Do like I did with the power lines and make a proof of concept map which we can then copy from and modify as needed. I have one idea that came to mind, not sure if it has already been mentioned but I didn't see it in the document. How about, workers 'assimilate' themselves into the buildings (much like transformers), basically the same way drones are used in Zerg, however. If you send more workers to help with the building, they assimilate themselves into the building and speed up the build time. Even this (and this is coming to me as I talk now), all buildings require a certain number of workers. Say, from the command centre, you place a blueprint for free (or maybe gas depending on the structure). You then send workers to get assimilated, and for example, a mineral extraction building (as mentioned above) would require one worker, and a barracks would require 5... and that's it's progress. Sort of like, buildings' cost and time to build is measured in workers. This could then lead to the concept of everything in the race boils down tiny identical robots working as a unison to form something greater. And addressing the concept of upgrade focussed race, how about upgrades cost only gas, and units and buildings cost only minerals? Methinks this could help with scouting them, so if you see they have a gas mine, they're clearly going a expensive units with upgrades build, or no gas, clearly more cheap units build? In short you read the latest WDE. Consume Build - The building consumes a type of unit to make progress in building, so it would take say 20 of this one type of unit to actually complete the building, those units would be no more but at the end of it there would be a complete building. So basically, generally and obviously... add more rocks. Hope is just deferred disapointment. Still having a consume build might be not a bad idea and the system for it is already submitted. I think that having all your workers turn into the building is a bit too zerg-like. What if one unit turned into the basic structure of the building or T3 unit, then you could send one over to finish the building. And, like campaign, the more you send over, the faster it goes? I guess so, I mean yeah the zerg style helped me think of it. But I figured it'd be different, because you wouldn't have a timer to build, it'll wait indefinitely until you have the appropriate amount of builders, hence, if needs be you could instantaneously produce a building, or wait until you've built extra workers? Guys, first we need to get smoe basic combat units working. If we start messing with the races' economy there no way we can know how unbalancing it will be. There are some interesting ideas there, but remember that blizzard scrapped some ideas just because there were exploits, or cheese tactics to be used against, or some other problem. Basically what I saying is that we need to be at least in alpha testing phase to check these ideas separately. EDIT: temporary building over mineral fields is a good idea. Must not be avaiable from start though. That "everything made of workers" is not a good idea. Other players would hunt workers like hell, and "robot" players would have a hard time keeping their economies running and their workers production up to their need. That "everything made of workers" is not a good idea. Other players would hunt workers like hell, and "robot" players would have a hard time keeping their economies running and their workers production up to their need. I don't want to draw this out, but would it? Because in comparison, you have no other reason to spend your resources if everything was built out of workers, so you'd immediately be building way more workers than anyone else. Besides the fact that that is already a major objective of the game, to destroy the enemy workers... thus you wouldn't have to keep your economy running, because you're building units to mine resources and some to build, you could even make them separate units, but that seems against the concept of the idea of this race being versatile. Overall I'm saying that yes, if buildings still cost, and workers were equally flimsy in combat as a normal drone then of course you'll get arse whooped every time. However, introduce stuff like, making them a little tougher to represent the greater value as whole? Anyways, I dunno how much I can contribute to this whole thing, I'm fairly new, I was just browsing this and the idea came to me :-P, hence I hadn't really realised the basic units hadn't been boiled down. Maybe the workers could be cheaper/faster to produce than other races but you have to constantly build them to feed your construction. We are all giving this new race more restrictions than any of the 3 original races have. And then we are trying to balance these restrictions with buffs that may be unbalacing themselves. Cheaper/faster workers make a huge impact in economies, its not whitout a purpose that blizzard gave the 3 races workers with the same cost, speed, attack range and so on. If we walk away from that formula, we must expect several balance issues. Keep this new race's functionality closer to that of original races. But that's just my opinion. I agree with Soul. We should just leave the workers as SCV copies for now, in my opinion. It is a nice in-between of the build styles. You worker is useless to ou while building, but isn't used up entirely. Something that occured to me. All three of the main races have a 'dropship'. All three dropships preform another task alongside that though. And two of the three are mid-tier, with the overlord getting the abillity to become it around mid-tier. So, I was thinking our flyer should combine with something to make a dropship. We were planning on having a gound based transport that can jump chasms and become a unit cannon. But the thing is that air-based transports are used for the reason that they work. It is sort of like the workers: The three other races have a few things in common, and there is a good chance they have them in common for a reason. @AtikLyar: Thats what I'm trying to say the whole time. There are many things in common for the 3 races. In my opinion the 4th race should stick to that. 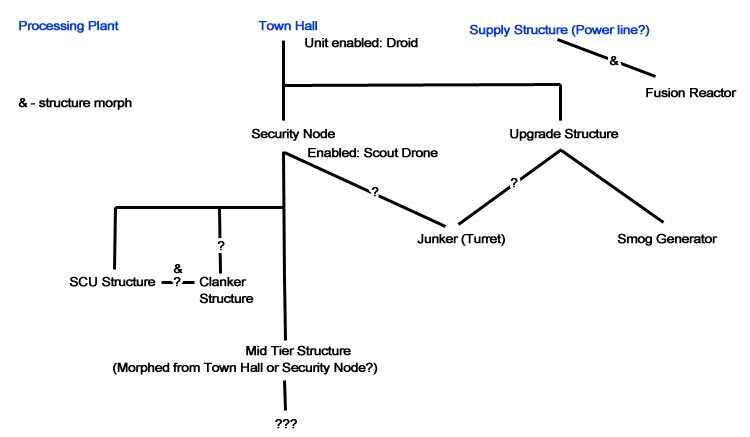 Workers, the building that unlocks the first combat unit and higher tier buildings, an upgrade building that unlocks a turret, a transport flyer, a detector flyer, a second upgrade building for higher tier, and so on. EDIT: Attached a picture so we can plan the tech tree, I used the blueprint as a start. The Fusion Reactor is one idea I had, so players wont need to rely on their town halls as their only power source. It would be morphed from the standard power line structure and would be cheaper than a town hall. The transport unit is purely for traversing cliffs and chasms. Using a hunterling like leap to cross chasms would make it as useful as any other races transport. But then it would be easy to cut off. You notice that, in the even of mass lings everywhere, hot-dropping your marines into your opponent's base works great? Even better with stalkers. The transport you mention is much more vulnrable. Which is why it moves faster than other transports to allow it to maneuver and has an upgrade for a unit cannon to allow hot dropping troops.